Remove crusts from bread. Cut bread into cubes. Put olive oil and crushed garlic into a shallow dish. Mix well. Add bread cubes to garlic oil mixture and mix by hand until bread is well coated. Place bread on a baking tray and cook for 10 minutes. 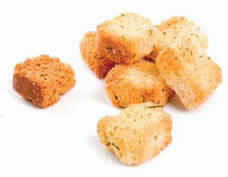 Let croutons cool over night. Place in airtight container and keep for 1 to 2 days.